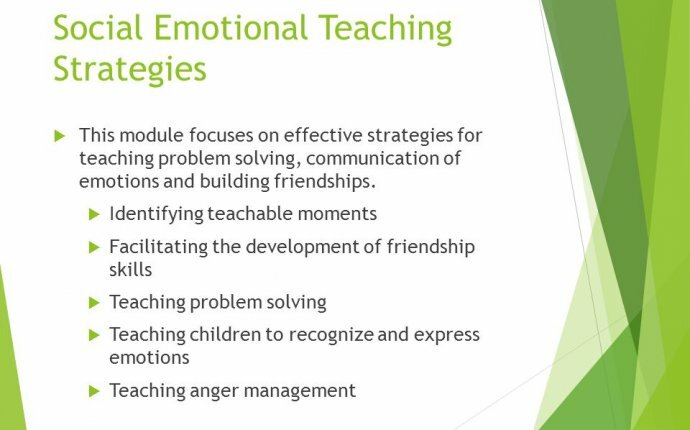 You can promote social-emotional development in your classroom by embedding your teaching practices throughout the day. Remaining sensitive to children’s needs helps them feel secure and confident, and acts as a model for effective social behavior. For example, asking questions to help children find a solution to a social conflict helps them develop problem-solving skills. Reading a story and engaging children in a conversation about a socially challenging situation can also serve as a lesson in handling social problems as well as in literacy. Be Attentive to Each Child’s Needs - Be attentive to the social-emotional skills and needs of each unique child so you can respond with lessons and interventions tailored to help every child develop their skills. Your attention and presence as a teacher can be a pillar of confidence for children who are dealing with stressful life circumstances. Letting children know that you are there to help will build children’s trust that you are a source of guidance. Keep in mind that children who are English language learners may need additional support to feel secure and self-assured in a learning environment that is responsive to their needs. Early Emotional Experiences Matter - Recognize that the emotional domain is foundational to all other developmental domains. If children start school in an emotionally supportive environment, they will acquire the love of learning necessary for success in all areas of school. “As young children develop, their early emotional experiences literally become embedded in the architecture of their brains, ” therefore great care should be given to children’s emotional needs, according to the . If you seek children’s opinions, allow children to initiate activities and are flexible about responding to children’s ideas, you’ll build children’s feelings that they are competent and respected, and at the same time motivate their desire to learn. Promoting Consistent Structure with Play - Providing your transitional kindergarteners with consistent structures and expectations about appropriate behavior through play activities helps them remember and follow classroom norms, and behave in ways that are conducive to learning. According to the American Academy of Pediatrics, “Play is integral to the academic environment. It ensures that the school setting attends to the social and emotional development of children as well as their cognitive development.” Creating routines of fun and meaningful activities such as songs, chants and games can minimize problems or stress during challenging times, such as when children wait in line or during transitions.